Sole: Heavy-duty lug sole keeps you on your feet in varied terrain. It is a marking sole. 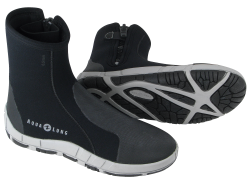 Feature: Lace-up synthetic leather and 5-mm neoprene upper provides warmth, unmatched ankle support and a secure fit. 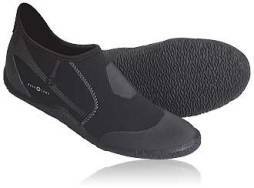 7-mm neoprene insole absorbs the shock of every step. 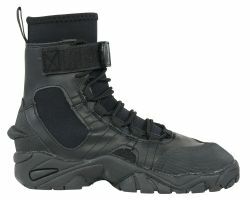 Wear areas are reinforced with synthetic leather and rubber. 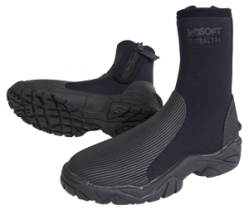 SeaSoft uses a hard athletic sole when manufacturing their boots. This eliminates the up and down motion of the foot (inside the foot pocket of your fins) that causes cramping. By bypassing these small muscles, SeaSoft Booties use the large muscle groups to powerfully move you through the water. Join the US military, police, sheriff and fire departments and thousands of other divers in discovering just how warm, comfortable, safe and effective you can be in SeaSoft Booties. 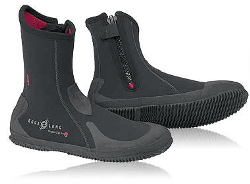 SeaSoft boots work well with Apeks RK3, Aqua Lung Rocket II, Aqua Lung Shredder SAR, and Hollis F2 Fins. A favorite for military and search & rescue operations.